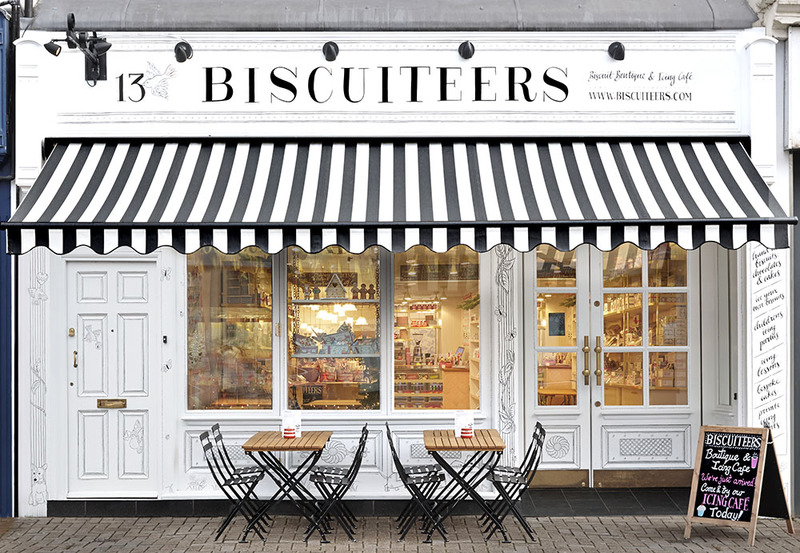 Our Boutique & Icing Café on the Northcote Road, Battersea has been open for over a year now. Along with all our beautiful biscuit, chocolate, cake and cupcake collections you can buy a selection of icing equipment, enjoy our Afternoon Tea or join us for coffee and cake, whilst icing a biscuit or two. Come and visit us – we sell a delicious range of homemade cakes, biscuits, tarts and macarons as well as hot and cold drinks for you to enjoy in store or take away. What’s more, if you are looking to become a Biscuiteer, why not try our School of Icing where we can teach you the all the tricks and techniques so you can ice your own biscuit tin to take home with you. Had an absolutely wonderful time catching up with a friend. We decorated 3 biscuits, which was so much fun and drank tea whilst we waited for them to bake. All the staff were attentive and very knowledgable about their products. The shop was absolutely beautiful and I’m already planning on bringing many people back here for another visit. Thank you. Great fun for me and my teenage daughter. I would have liked greater choice of shape of biscuit; I think it is expensive  for what you get. Also, the biscuits came back from the drying oven still wet which meant they all smudged in the packaging and rather ruined all our hard work! I had my daughter’s birthday there, and it was amazing. The girls loved every aspect of icing the biscuits, the surroundings and offcourse the gift box and apron. The staff were great and beyond. We had a lovely time. The girls thoroughly enjoyed the icing lesson. Agnes was a delight and very helpful. Afternoon tea was disappointing and totally overpriced. The quick tutorial was a bit too short it was like less than one minute. The colours that we were able to use were restricted....no black and only a tiny amount of pink ......not great when you have a little girl who is a pink queen!! While I did enjoy the hour spent at the Icing Cafe decorating biscuits with my daughter, I was disappointed that we were only given line icing to use. We would have enjoyed experimenting with flooding icing too (even just a couple of colours) when decorating our biscuits. Lovely afternoon tea. Great choice of hot drinks and cakes and biscuits were delicious. The shop is absolutely beautiful, it was so pleasant to sit in! 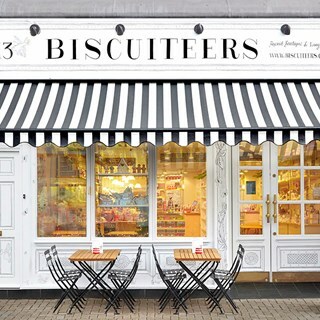 Myself and the kids were very excited to use our DIY biscuit icing vouchers in Clapham, and I read lots of enthusiastic info on the website about pride in the business, plus I’d purchased lots of biscuits on-line over the past year for friends. I thought it was a bit expensive for what you get. The staff seemed bored and fairly keen to get us out as they kept asking us were we finished after 30 mins, and as there were no other customers apart from us and it was midday, I thought that was a shame and not great for kids to hear. Anyway, despite the staff being a bit lack lustre, it was such a lovely activity to do! We had been looking forward to a Christmas themed afternoon tea at the Biscuiteers on Northcote Road, but sadly were disappointed with the poor customer service and came away feeling that the experience was significantly overpriced. We had to wait until 11am for the Co-op to open so they could buy milk to make us a drink. The booking had been in the diary since May- need to do better. Venue is lovely but not much atmosphere. Service was slow even though there were only two tables being served including mine. Cakes were nice but biscuits were a bit dry. The 4x girls working in the shop were “busy” and paid us no attention. No tuition on how to ice the biscuits. I was very disappointed by our visit last Sunday. On arrival we were positioned at a table near the toilets and industrial fridges. Despite there being empty tables our request to move was met with a severely lacking in festive cheer and reluctant manager. We moved. Ready for the icing itself! Well colours shown on existing biscuits were not provided, nor were any tools to design our own. Piping bags and a measly quantity of sprinkles were placed on the table plus a plethora of biscuits which we were told were £2 extra to decorate on top of what we paid in advance. Some biscuit shapes were impossible to decipher what they were. No-one offered us drinks and so half an hour we had left and went to enjoy hot chocolate elsewhere. 2 hours later we received a call asking why we hadn't arrived for our booking! Says it all really. We won't be returning. Your staff are some of the nicest people I have ever met. They were so, so lovely with my son, chatting with him and showing him the biscuits they were working on for a private client (and all I can say about those is, wow!). He can be stressed and want to leave new places, as he has Aspergers, but he felt so safe and comfortable with you, thanks to the lovely setting and wonderful staff. It brought out who he is when he feels safe and confident, to an extent that's hard to convey to anyone who hasn't seen him retreat into himself when stressed. We will be bringing him back after Christmas, without any doubt. Was a real highlight in his run-up to Christmas, and please thank your amazing staff for us. So touched by the kindness, interest in what he had to say, and real effort made to ensure he had a lovely time. We've been buying biscuits from you for some time now, as they make such perfect new baby/housewarming presents, as well as being part of our own Christmas traditions, but had never been to the cafe part. That will change - and not just for icing lessons; the cakes and coffees and mince pies were lovely, too!